IoT applications in waste management are engaging citizens and cities alike in the project of making our waste practices more sustainable. Optimizing garbage collection routes based on actual disposal unit fill levels—as measured by fill level sensors—is one such application that's proving to be quite impactful. Ultimately, truly transforming waste management will require deeper collaboration between public and private stakeholders. Waste management is a key part of city management—especially where it has become important to rethink cities for environmental sustainability. We must look for sustainable means to manage, reduce, and reuse the mountains of waste generated in cities every single day. A right step in this direction would be to bring technology into everyday city management operations. Internet of Things (IoT) has successfully penetrated aspects of businesses. It’s terraforming entire industry landscapes from education to retail to healthcare, and from automotive to entertainment. As IoT’s impact on the waste management industry increases, the future of recycling looks promising. IoT applications in waste management are effectively improving municipal operations. 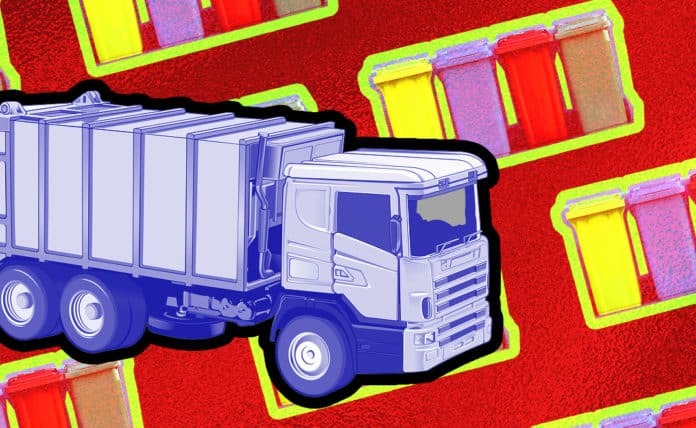 Predefined routes and outdated methods of waste collection are increasingly being replaced with sensor-enabled bins and sophisticated waste management applications. The success of any IoT-enabled application lies in the collection of a vast amount of data, often in real time, and the distillation of those data into insights on which users can take action. As sensor technology advances, a whole array of everyday objects are being connected to the internet (and to each other) to exchange information interactively. The most common IoT application in waste management operations currently is the automated route optimization of garbage pickup trucks. These trucks generally follow a specific route every day to collect trash. For those sanitation departments that have yet to harness IoT connectivity, the drivers generally don’t know how full a trash bin is before they encounter it. That results in a lot of wasted time, fuel, and therefore money. IoT applications in waste management are improving this scenario by giving sanitation workers insight into the actual fill level of various disposal units, whose loads can vary by the day, the week, and the season. Sensor-enabled and internet-connected garbage bins can collect information on fill level, temperature, location, or whatever data types the sensors gather and the sanitation department finds useful. With a user interface revealing the locations and fill levels of all bins, waste collectors can get an automated route planned for them that has prioritized areas in urgent need of cleanup and avoided disposal units that still have room. Not only are these bins optimizing fleet logistics operations and reducing fuel consumption, they’re also recording the number of times they’re emptied and how fast they fill up. Such data, when combined with statistics from other smart city systems, can facilitate more insightful, multi-pronged actions, such as planning better distribution of garbage bins, zeroing on problems (e.g. incorrect disposal practices), or reducing waste going to the landfill. Sanitation departments are beginning to unlock new value by leveraging IoT applications in waste management. For example, ISB Global is using IoT-powered applications to manage waste more effectively. Using sensors installed on each bin, cloud-based data collection and synthesis, and a user interface / smart app, ISB has created a network of connected devices for effective waste management. Their systems also capture data such as weight, volume, costs, truck number, and feed all the information back which can further automate billing and invoicing operations. This is but one example of a company pushing the envelope with IoT application in waste management. More innovation and standardization are needed. The next step for “digital bins” lies in automating the categorization of waste content, a task at which most people make mistakes. Polish company Bin-e has come up with “Smart Waste Bins” capable of identifying and sorting waste into up to four categories: glass, paper, plastic, and metal. The Bins then compress the waste and notify sanitation workers of fill levels for each waste category. Intelligent categorization and segregation is an upcoming trend. It’s still being refined for larger scale deployments. Smart Bins like those above have the potential to raise stakeholders’ awareness of the power of IoT applications in waste management by providing them with visibility into their daily waste footprint. By integrating inputs from hardware units (sensors) into software applications, we can allow sanitation departments better to analyze waste patterns and optimize routes while also allowing everyday citizens to manage their consumption and waste habits more sustainability. Even Smart Packaging with digital tags (QR codes, Barcodes, Datamatrix codes, RFID & NFC tags) can play a part in ensuring people recycle and dispose of waste responsibly. Those confused can rapidly pull up instructions on how to dispose of a particular item in an interactive format, by a simple scan of the digital tags with their smartphones. But what about e-waste items such as large batteries or electronics? Electronics contain platinum, gold, silver, lithium, and palladium as well as other raw materials such as iron, copper, and aluminum—all valuable resources that can be recycled and reused. With the breakneck pace at which electronics are penetrating every aspect of our world, the amount of e-waste we generate is likely only to climb. This opens up a whole new set of opportunities for businesses to use digital twins of sanitation systems to recycle e-waste for precious and finite resources. The ultimate goal of IoT applications in waste management is producing leaner operations and delivering higher quality services to citizens. A growing collection of interlinked autonomous systems are managing everyday urban operations and improving both citizen experiences and our carbon footprint. Ultimately, however, we need deeper coordination between public sectors—through a mix of regulation and incentives—and private sectors—through a willingness to engage with regional, state, and federal agencies to use IoT applications in waste management to build a better and more sustainable future. Written by Neil Sequeira, Director of Product Management & Marketing at QLIKTAG Software Inc.